REDWOOD CITY, Calif. - March 13, 2017 - PRLog -- Recently, janitorial employees from Service by Medallion Facility Services (Medallion) working at Oracle Global Headquarters in Redwood Shores, CA completed the U.S. Green Building Council (USGBC) Green Janitor Education Program through the Building Skills Partnership (BSP) program. The Education Program was developed by the USGBC, Building Owners and Managers Association (BOMA), and Service Employees International Union-United Service Workers West (SEIU-SWW). The participating members enhanced their skill set by investing in over 30 hours of classroom training during a month's period to achieve this milestone in their careers. The Green Janitor Education program curriculum provides janitorial workers with hands-on energy management and green cleaning training to address building operations and maintenance practices that are aligned with Oracle's sustainability initiatives and performance standards. The program also touched on other important green attributes such as recycling, waste management, water conservation, and green cleaning practices. 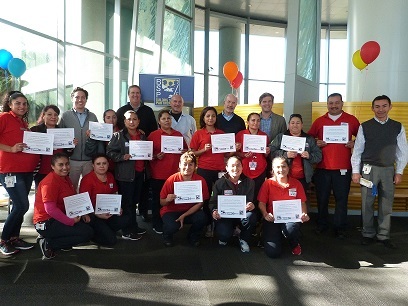 With representatives from the USGBC, BSP, Medallion and Oracle, the custodians were received with a graduation ceremony to celebrate their accomplishment at Oracle Headquarters. During the event, employees were honored with a Certificate of Completion, a distinguished pin and a bonus check in the amount of $125 provided by BSP. At the catered lunch, the employees not only had the opportunity to meet-and-greet members of the Oracle Facilities and Real Estate group but they also shared some of the key topics they had learned throughout the course with them as well. Both Medallion and Oracle find the BSP program to be an integral part of the success in the Facilities Program at Oracle. Both intend to continue this unique partnership to provide high quality vocational education and training programs to increase workforce capacity and economic performance of property service works. Service by Medallion is an award winning Facility Support Services company servicing Corporate Campuses with janitorial, supplies, building repairs, and staffing throughout the West primarily focusing on the Greater Bay Area. Contact Service by Medallion if you too would like to learn about our proven campus green maintenance programs and how to save more water, reduce more waste and conserve more energy. Service by Medallion is committed to delivering "Best in Class" industry leading programs and services through real time response, innovation, technology, performance analytics, and expertise.